After Sunday’s crazy hailstorm – pea-sized stones pelted us for nearly half an hour! – it was surprising to see sunshine and blue sky the next day. 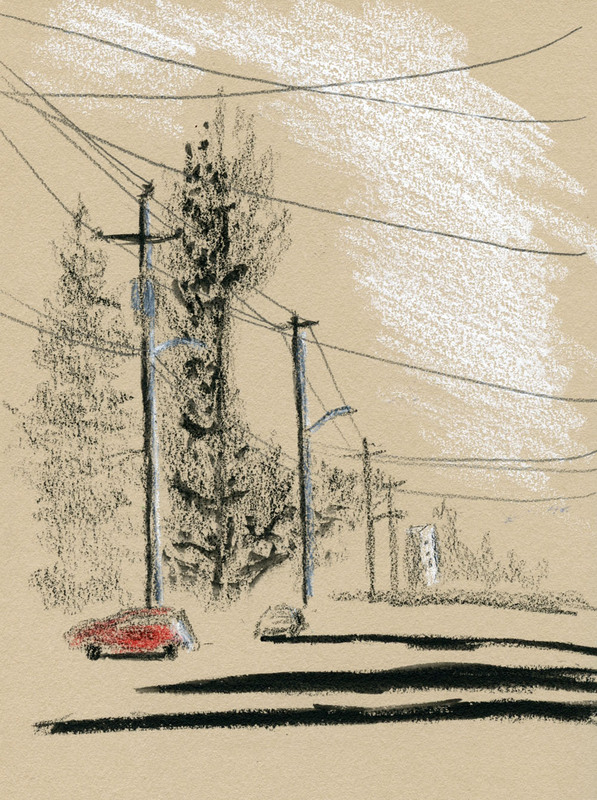 Still, the temperature was only in the mid-30s, so I stayed in my car again, marveling at the long, long shadows even at high noon. It’s no longer pitch when I wake, and there’s still some twilight left when we sit down to dinner. But this winter stuff is getting old. Who’s ready for spring? Last Saturday I was especially interested in that day’s demo – drawing animals with Derwent Drawing Pencils (my link goes to Blick.com because, sadly, Daniel Smith doesn’t sell anything but paints online anymore). 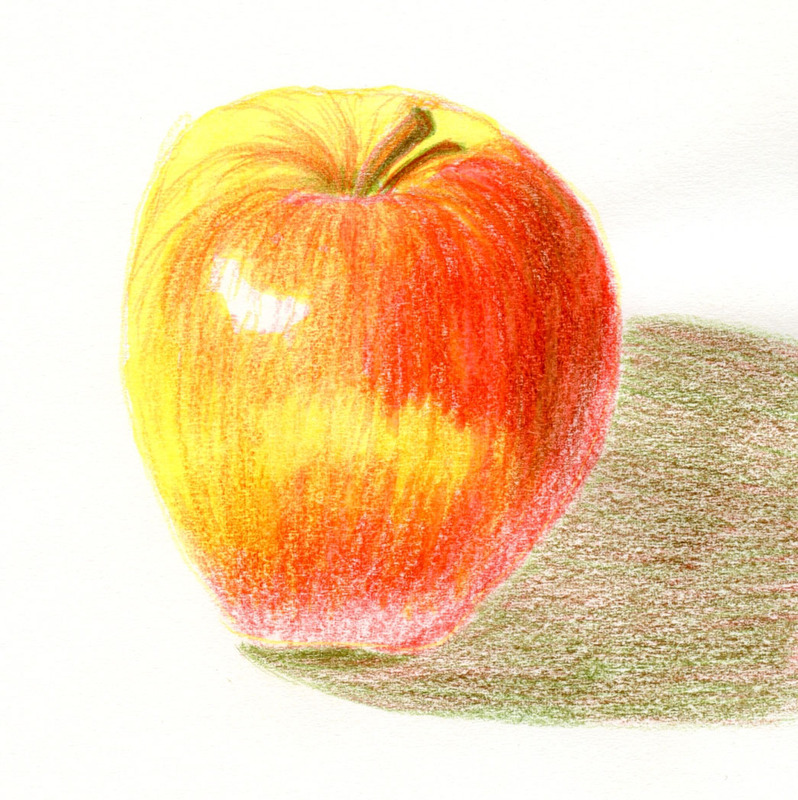 I have a set of those colored pencils, and they are very soft and have especially thick cores. The relatively narrow palette of 24 colors is unusual in that all the hues are earthy and subdued – ideal for landscapes and other natural subjects. The white one is a favorite with toned paper, and I have used a few rocky, sandy hues when I’ve sketched at a beach or a national park. Julia Carpenter, the artist who demo’d the Derwents that day, put the soft colors to good use drawing a cat and then a dormouse from photos. Of course I was paying attention – but I also couldn’t resist sketching her. Pentel sign pen (a hard-tipped brush pen). I change out the brush pen frequently, so this one is not necessarily a favorite, though I do like it. The Pentel has water-soluble ink, which is nice for fast and easy shading. But now that I’m back to using water-soluble colored pencils, I’ll probably switch to one with waterproof ink. I also like to switch between real (“hairy”) brush tips and formed “non-hairy” tips, because each has benefits (and drawbacks). The Copic Gasenfude is a favorite hairy one containing waterproof ink. See the post on my favorites in all categories for details. Diet tip: I used to carry four brush pens – two hairy (one with waterproof ink, one with water-soluble ink), and two non-hairy (one with waterproof ink, one with water-soluble ink). Now I make a choice and carry only one. Two Sailor Naginata Fude de Mannen fountain pens, one with waterproof Platinum Carbon Black ink (very waterproof and non-clogging) and one with water-soluble Sailor Doyou ink (fast drying). These have been my stable, consistent pen-and-ink combos for several years now. For variety, I occasionally rotate in my Franklin-Christoph with fude nib, but it’s not a sketch kit standard. Faber-Castell Pitt Artist brush marker in warm gray. I like it because it’s waterproof and is handy for quick shading on both white and toned papers. Two Kuretake waterbrushes with the largest and smallest tips. An emptied hand sanitizer bottle that I’ve filled with water for spritzing (see my demo for one technique I use). 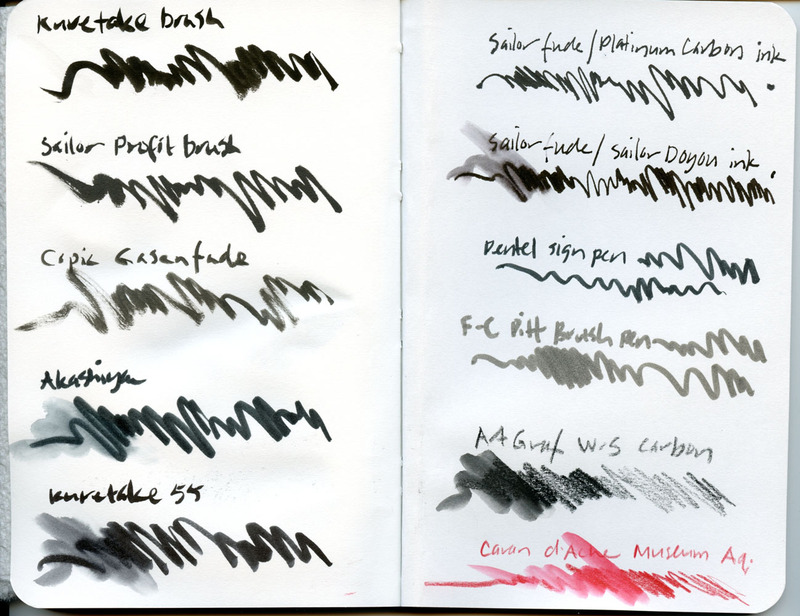 A low-quality traditional brush that I use only to spread water that I’ve sprayed onto paper. A white Gelly Roll gel pen. I use it for sharp highlights on red or toned paper and whenever I need to write white signage lettering. A Viarco ArtGraf water-soluble carbon pencil. I also use water-soluble graphite pencils in a soft grade (the ArtGraf 6B is a favorite), but this carbon pencil has the darkest darks I’ve ever seen when activated with water. It also doesn’t have the shiny look of graphite. A Blackwing pencil with the softest (ungraded) core. I swap this out frequently with other soft-core pencils – usually 4B or softer. Other favorites are the Mitsubishi Hi-Uni in 4B or 6B and the Gekkoso 8B. An ever-changing palette of water-soluble colored pencils (mostly Caran d’Ache Museum Aquarelle). 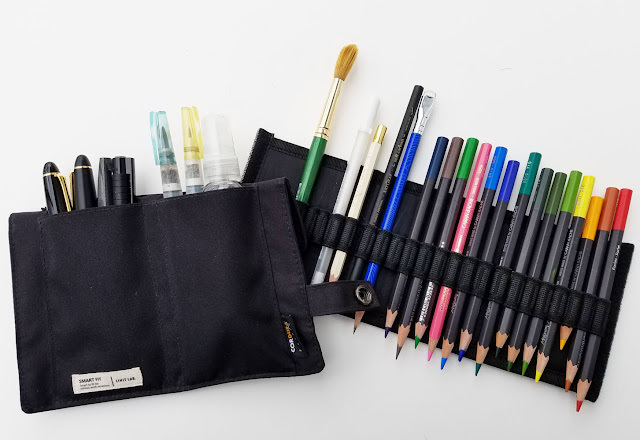 Right now I’m carrying 14 colors, but as you can see, my Tran Portfolio pencil case still has a few slots to spare. 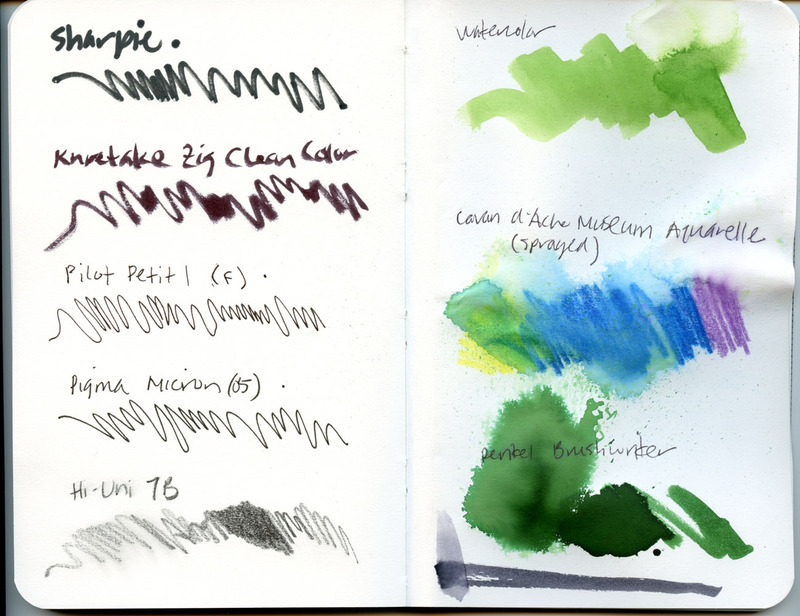 I always add one or two specialty colors when I travel (based on what I see in photos of the place I’m visiting). My goal is to carry no more than 18 colors under any circumstance, which would fill all the slots in the Tran Portfolio. 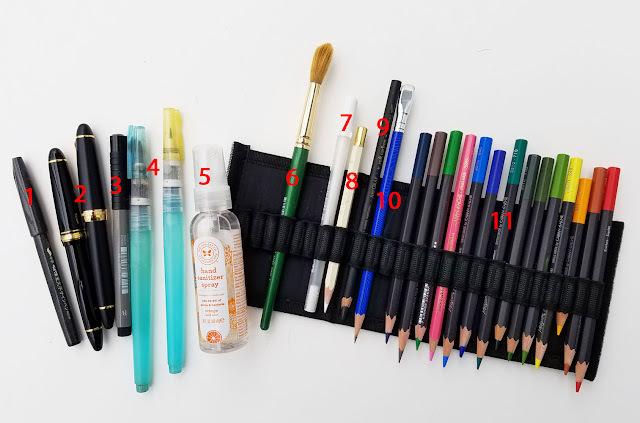 My overall sketch kit diet principle is to carry only one of each type of product (such as brush pen, gray tonal marker, water-soluble pencil, graphite pencil) instead of multiples as I used to. I always think I need to have choices, but the fact is, having to choose just adds to the time it takes to make a sketch. This principle is enforced by one rule: When I put something in, I must take something out. Now, the sketchbooks: Unlike pens, pencils and colors, my sketchbook selection is narrow and rarely changes. The sketchbook is an integral part of any sketch kit and is often the heaviest element in it, so it needs to be chosen thoughtfully. It is also the foundation for the rest of the sketch kit elements, because if you choose paper that is inappropriate for the tools and media you want to use, it’s likely that you’ll be unhappy with your results. 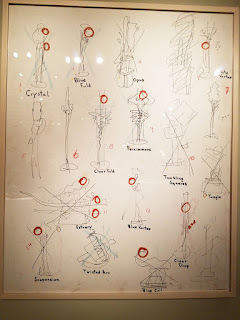 I tried many, many different sketchbooks – some more than once, many for only a few pages before I abandoned them – before I reached resolution on my carefully considered selection. While I always love experimenting with new art materials, I’m firmly devoted to my sketchbook selection because it just works for me. 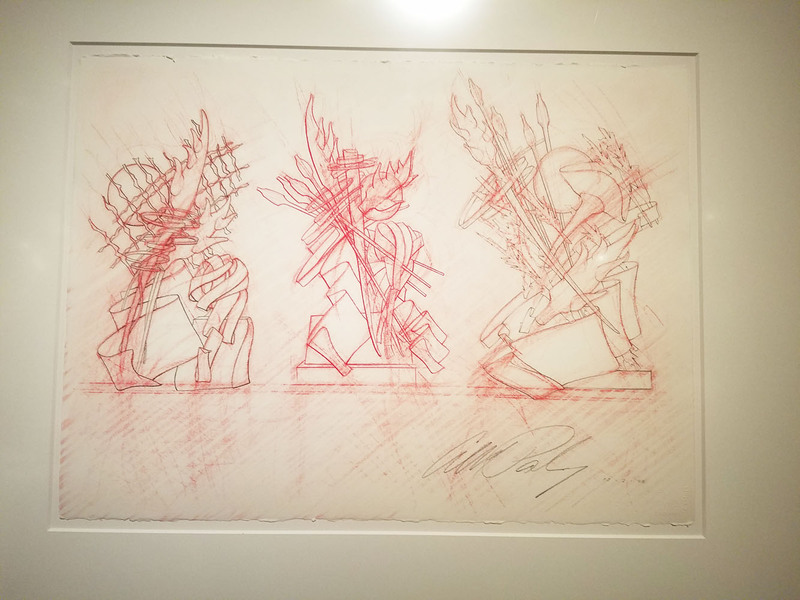 A self-made signature – four sheets of 9-by-12-inch Canson XL 140-pound watercolor paper folded in half and stitched with a temporary cover. This is my daily-carry sketchbook. When I have filled six of these signatures, I bind them together with Coptic stitch. 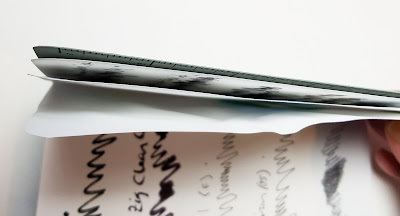 This is the lightest, thinnest, self-supported sketchbook I have found containing paper I can use with any media – but I have to make it myself. It’s a small price to pay for getting all my needs met. 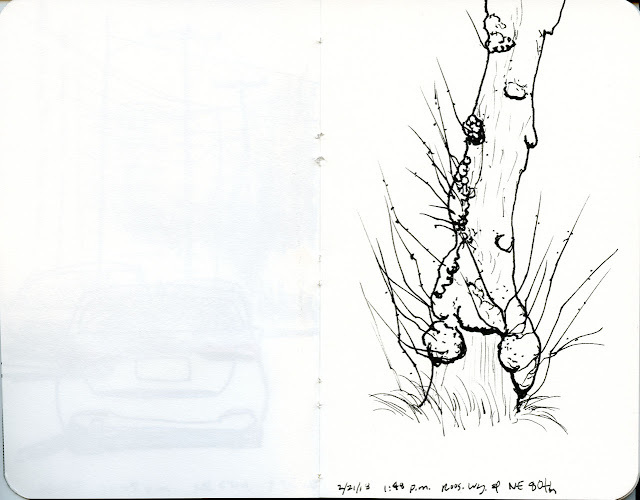 Stillman & Birn softcover sketchbook in the 5½-by-8 ½-inch size. Except for the two-month period when I challenged myself with a minimal sketch kit, the S&B books are not my daily-carry. I keep a variety of books with different papers (Alpha, Beta, Epsilon and Nova) on my desk for use on still lives and other experiments in the studio. I also take one 8 ½-by-5½-inch softcover landscape-format Beta book when I travel, since that tends to be when I use a landscape format most often. and 4. Field Notes notebook. I always carry one, most often a red Sweet Tooth edition, but occasionally others for variety, like the slightly larger Signature edition. This is handy for quick, perhaps discreetly made sketches of people on public transportation or other situations when I don’t necessarily need or want my full-size sketchbook. Top view of my slimmer bag! This is my waterproof Rickshaw Bagworks Zero Messenger Bag in the "small" size. My phone’s weather app said it was 37 degrees, and clumps of crunchy snow still stuck to the grass from the previous night’s flurry, but the sun was shining, and I was getting cabin fever. I pulled on my down jacket and headed out for a brief walk through the ‘hood. Within a couple of blocks I spotted a ubiquitous LimeBike standing on a corner. Seventeen minutes later, I was cold and done. It wasn’t much of a sketch, but it made me happy to be able to give it its true colors. It’s hard to sketch when your toes are tapping to lively bluegrass music! 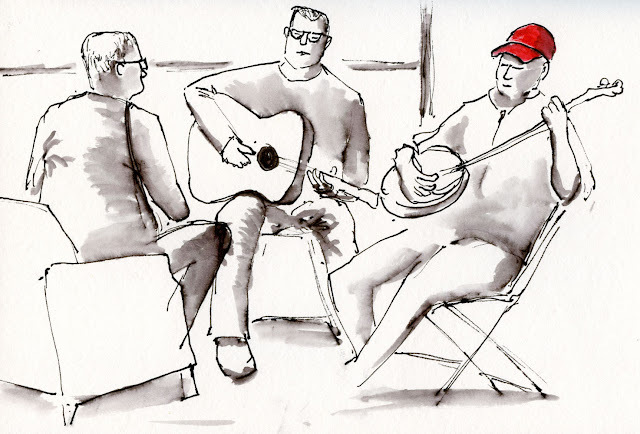 For the fifth year, Urban Sketchers Seattle met at Wintergrass, the Puget Sound area’s weekend-long annual bluegrass festival at the Bellevue Hyatt Regency. I missed it last year because I was out of town, so I was especially looking forward to this year’s event, which is one of my all-time favorite sketch outings. 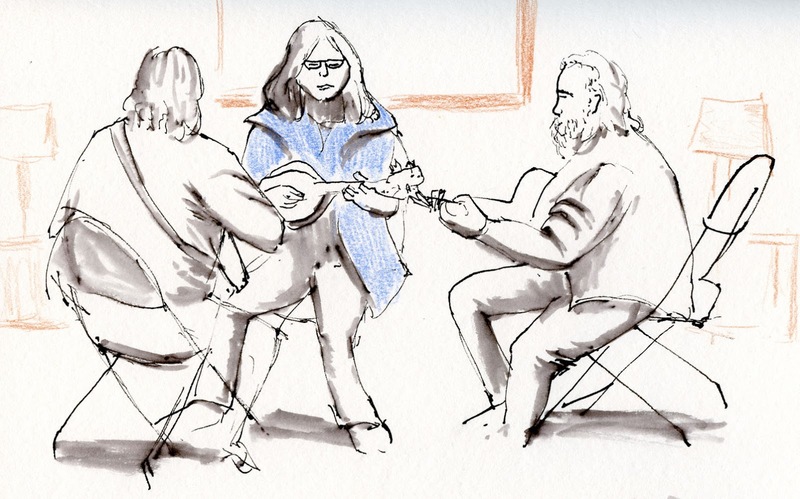 As I sketched the musicians who had gathered in the hotel hallways for impromptu jams, friends greeted and embraced each other, happily reuniting. Some had apparently come from distant states to participate in this long-anticipated event. I overheard them comparing program notes and planning which concerts and demos to attend. All morning, even as I heard the literal vibes of traditional music, I also sensed the vibes of happy people doing what they enjoy most – playing and listening to music. I don’t play an instrument, yet somehow their excitement felt familiar . . .
And then I suddenly realized what Wintergrass reminded me of: The Urban Sketchers Symposium. 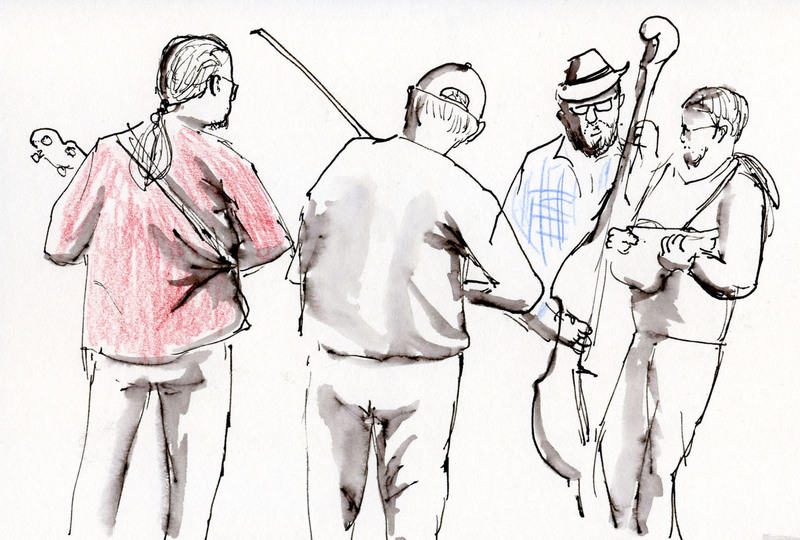 Instead of sketchbooks, pens and paints, they used fiddles, banjos and mandolins to express their common passion. Tapping and nodding to the music, I knew how they felt. its standard pocket-size editions. Shown here with a Sweet Tooth. 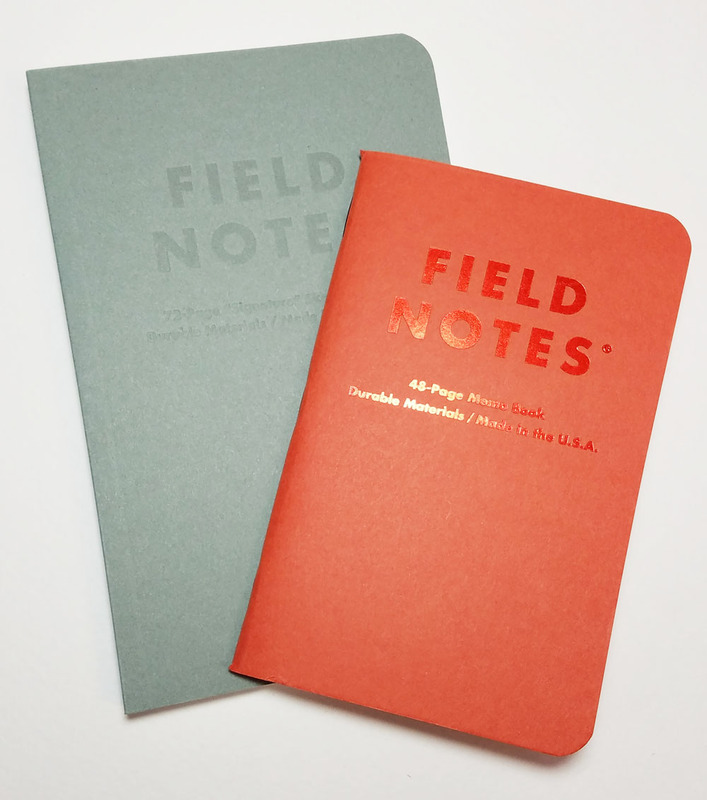 Last September, Field Notes Brand came out with Dime Novel, a limited-edition release of its pocket-size notebooks with several surprises – a new size, a new binding style and a new paper. You can read about the details in my review at the Well-Appointed Desk, but overall, I found almost everything about it to be a welcome change from the standard format (which I still enjoy using; my favorite is, of course, the red Sweet Tooth). The slightly larger 4 ¼-by-6 ½-inch size offers just enough more sketching real estate while still keeping the book portable. Like the usual stapled binding, the new Smythe-sewn binding enables page spreads to open completely flat, which is a non-negotiable requirement for any sketchbook I use. I also like that the squared-off spine has a more polished, finished look than a stapled spine. Finally, the paper – Strathmore Premium Wove 70-pound – has a pleasant tooth and can withstand just about any medium I have abused it with so far. Although not without flaws, Dime Novel has come as close to a “real” sketchbook as any of the hundreds of otherwise similar pocket-size notebooks on the market. Apparently others agreed with me, because the limited edition sold out in record time. Just this month, however, Field Notes Brand released a new regular edition based almost exactly on Dime Novel: Signature. 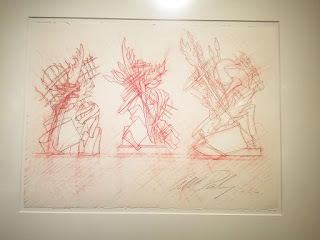 Available indefinitely, the Signature edition comes in a ruled version as well as blank. It contains the same Strathmore Premium Wove 70-pound paper as Dime Novel except in a bright “Ultimate White” color, which I prefer to Dime Novel’s ivory paper (at least for sketching with color; for writing or drawing in monochrome, the creamy color is a easier on the eye). I tested all the media I typically use for sketching, and even some I rarely use for sketching, plus various writing instruments. The very light tooth is pleasant to use with any implement (though I wouldn’t mind a slightly heavier tooth for graphite and colored pencil drawings). The only thing that bled through was (as expected) a Sharpie marker. 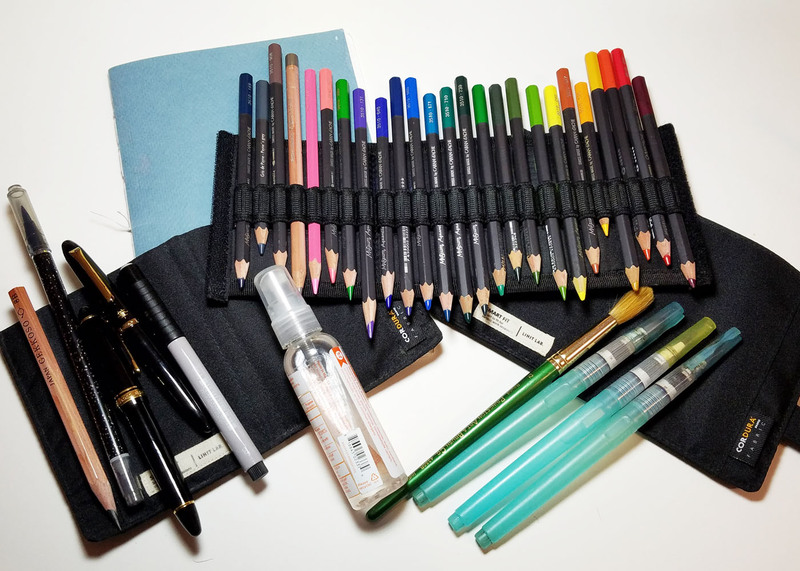 All my favorite brush pens, juicy fountain pens, markers and water-soluble pencils. Water-soluble media were swiped with water. 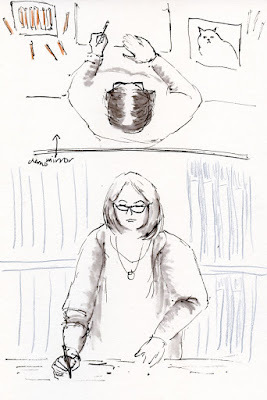 As it did when I tested Dime Novel, my Sailor fude nib with waterproof Platinum Carbon Black ink feathered slightly, while my second Sailor fude with water-soluble Sailor Doyou ink did not. However, in my test sketch of the knotty tree below, the mild feathering enhances the quality of the organic line. 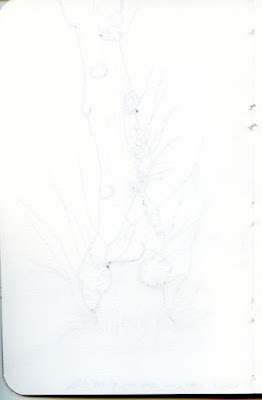 Wherever I paused slightly or applied more ink, it bled through a bit (see the reverse side below the sketch). With wet media, I really went to town on the abuse. On my watercolor, water-soluble colored pencil and Pentel Brushwriter swatches, I spritzed them with water – a technique I would not typically use on anything less than 100-pound paper. As you can see (test pages below), the spraying buckled the paper badly, but watercolor applied normally fared reasonably well. 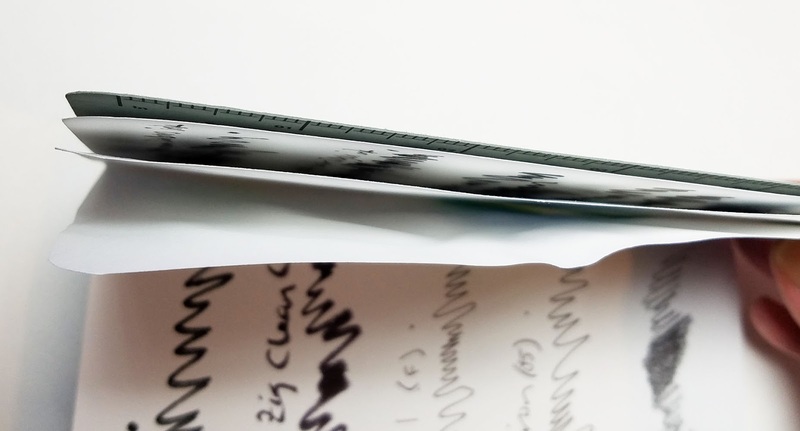 If there’s one thing I’ve learned from all the abuse I’ve given over the years to many types of paper that are often inappropriate for wet media (such as most notebooks), the sizing on a paper can be more important than its weight. In my Dime Novel review, I noted that the 70-pound paper in the Workshop Companion edition has the most wet-media-friendly sizing of all of Field Notes’ interior papers. Even my super-juicy Sailor fude with Platinum Carbon ink doesn’t feather or bleed on it, and lightly brushing water-soluble media with water results in relatively rich washes. 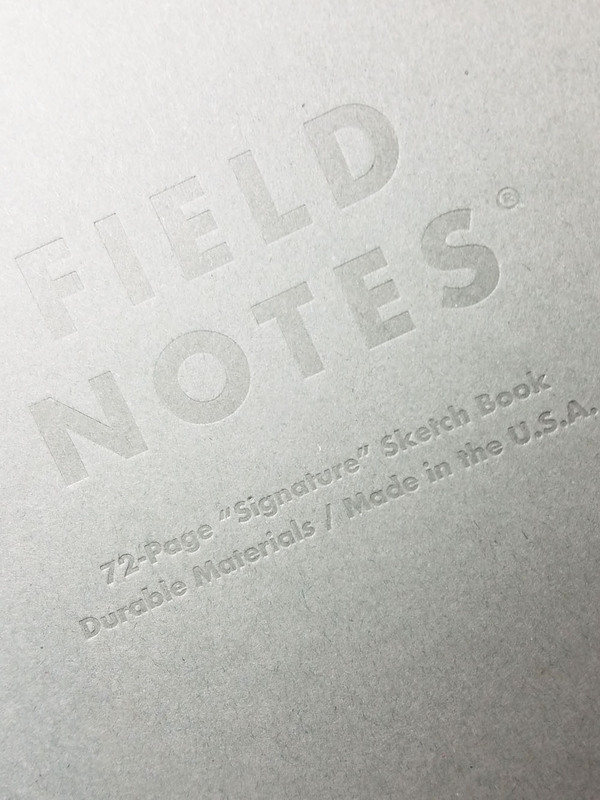 Although FN has deemed the 70-pound Strathmore Premium Wove used in Dime Novel and Signature to be “the highest-quality body paper we’ve used in any Field Notes edition ever,” “highest quality” is a mushy term determined by the specific need. More abuse -- Sharpie, more pens, soft graphite and various water-soluble media that I spritzed with water. 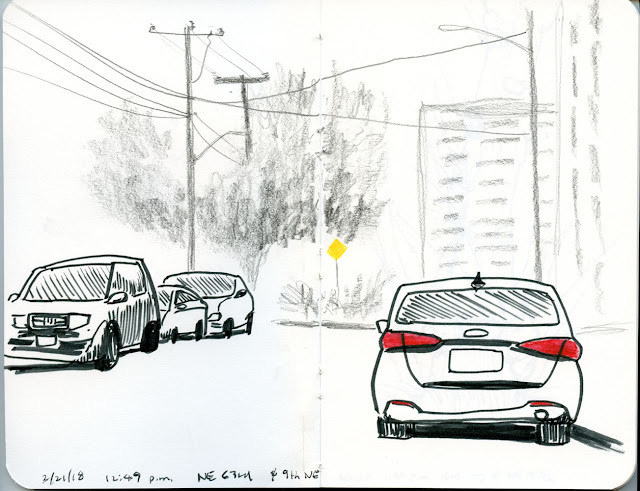 That said, I’m not complaining, as my particular casual sketching needs don’t exceed the quality of this paper. 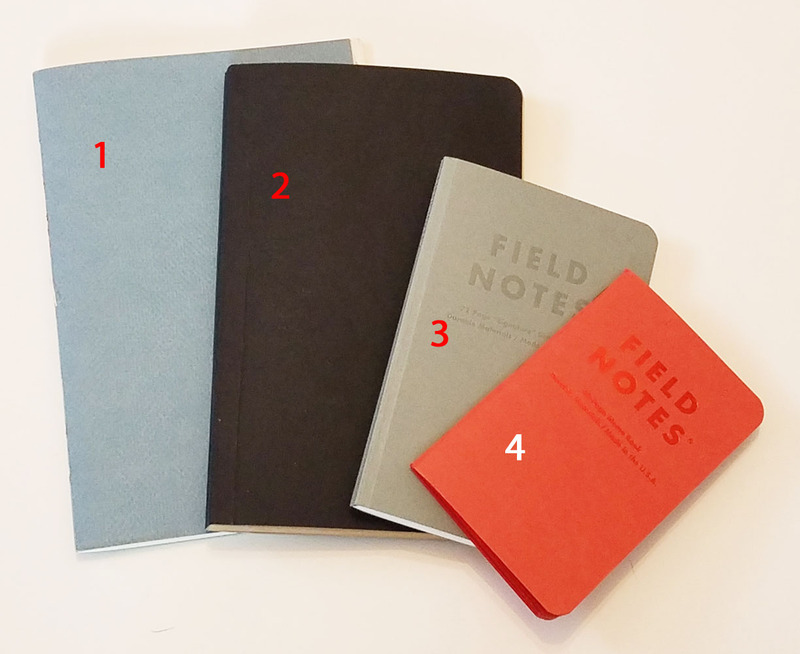 I use these small, daily-carry books as a supplement to my full-size, handmade sketchbooks – not a replacement. 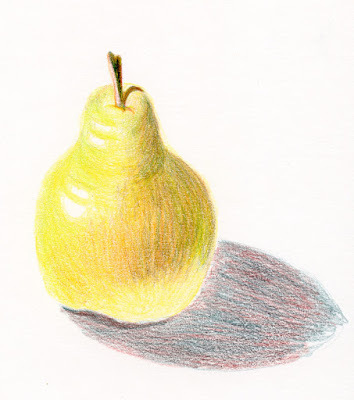 It sufficiently supported the multiple layers of Caran d’Ache Museum Aquarelle water-soluble colored pencils and the light wash I used in the apple sketch below. The colors show vibrantly despite the less-than-stellar sizing. 2/21/18 Caran d'Ache Museum Aquarelle watercolor pencils with a light wash. 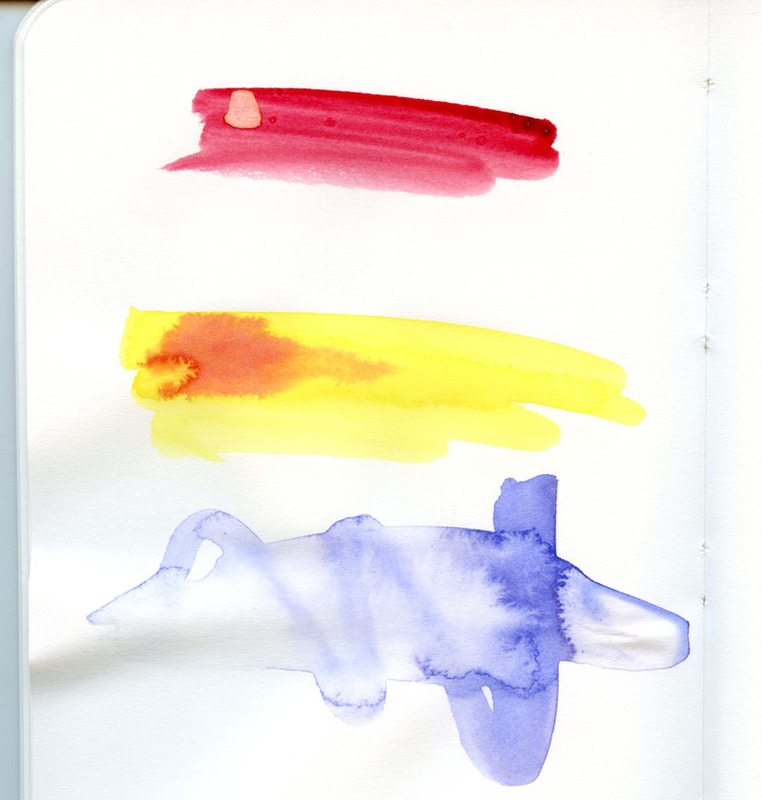 Although I don’t use watercolor much anymore, I know many sketchers do, so just for fun, I did a comparison between Signature’s paper and the student-grade 140-pound Canson XL watercolor paper I use in my handbound books (below). Although Signature’s sizing kept the pigments on the surface longer than I expected, the hues look slightly more vibrant to me on the Canson. 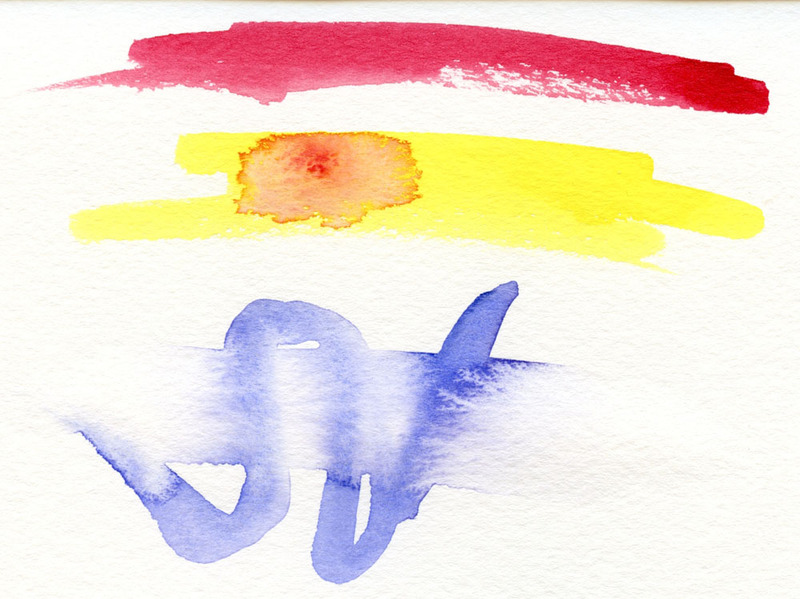 For light washes and spot colors in a casual sketch, I’d say the Signature can take watercolors adequately (though I wouldn’t recommend it to anyone who was serious about watercolor sketching). 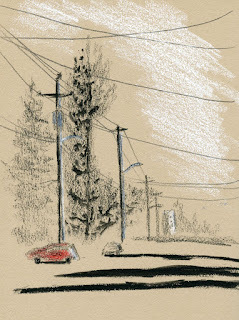 My mixed-media sketch of the street scene below is more typical of the type of sketches I put in a small-format sketchbook. I used a Pentel sign pen (a hard-tip brush pen with water-soluble ink), Museum watercolor pencils with a little water, and a Blackwing graphite pencil. I love the bright white color, and the tooth is a good balance for all of these media. 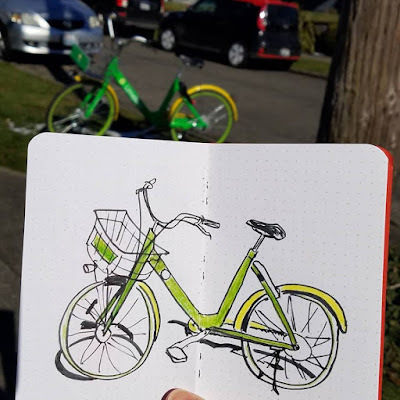 Look -- it actually says Sketch Book! Overall, I am pleased as punch with Signature – both its qualities and the fact that it’s going to be around indefinitely so I won’t feel a need to stockpile a limited supply. As I said in my review of Dime Novel, it’s an ideal cross-over book for both writing and sketching – it’s going to be my next travel journal. 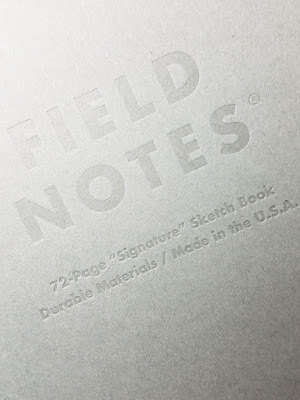 This is just a small thing, but I am tickled by it: While Field Notes has offered blank paper before (Sweet Tooth, of course, and its basic Kraft notebook has an unruled option, plus the forgettable Arts & Sciences edition is half plain), this is the first Field Notes product (possibly the first of any of the ubiquitous pocket-size notebooks offered by many makers) to be called a “Sketch Book.” Finally, I feel recognized as part of a small but ever-growing segment of the notebook-using community. (OK, after all the whining I’ve done, I also feel just a teensy bit vindicated.) 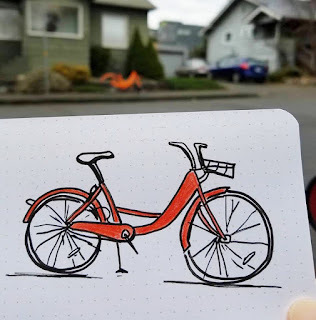 We all write; some of us draw, too. At last, there’s a place for both – in the same notebook. A couple of weeks ago I spotted a tree in the ‘hood decorated with one Christmas ornament. 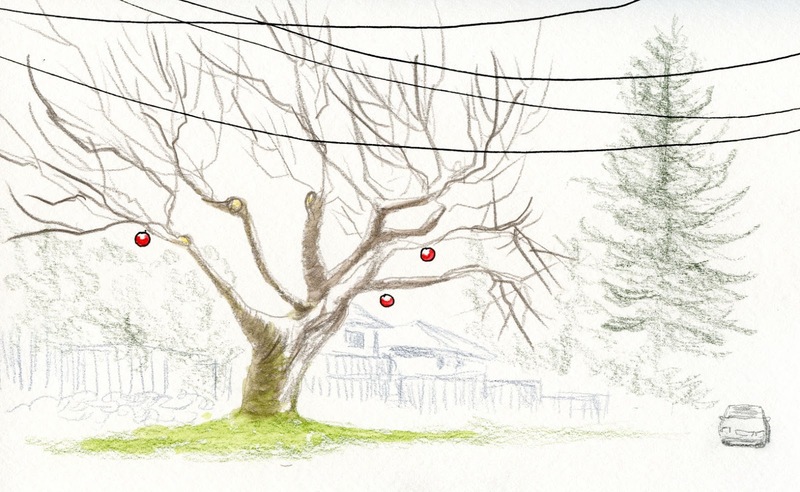 Just yesterday, only a few blocks away, I spotted another festive tree. Holiday decorations in February are getting a bit old, in my opinion. But on the other hand, it started snowing as I sketched this, and there’s a chance of more snow later this week too, so maybe we’re just getting started with winter. P.S. 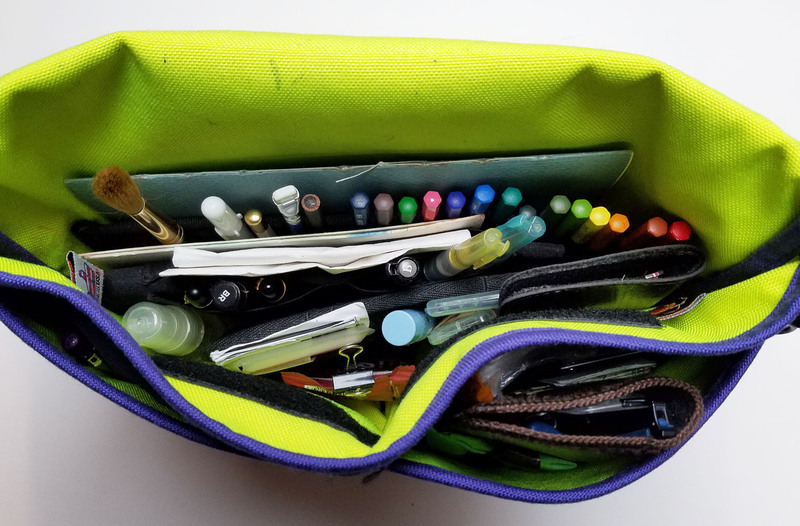 Yes, I am happy to have color back in my bag! I’ve been busier than usual lately with several volunteer projects with firm deadlines, and it’s been hard to squeeze in time for leisurely sketches. 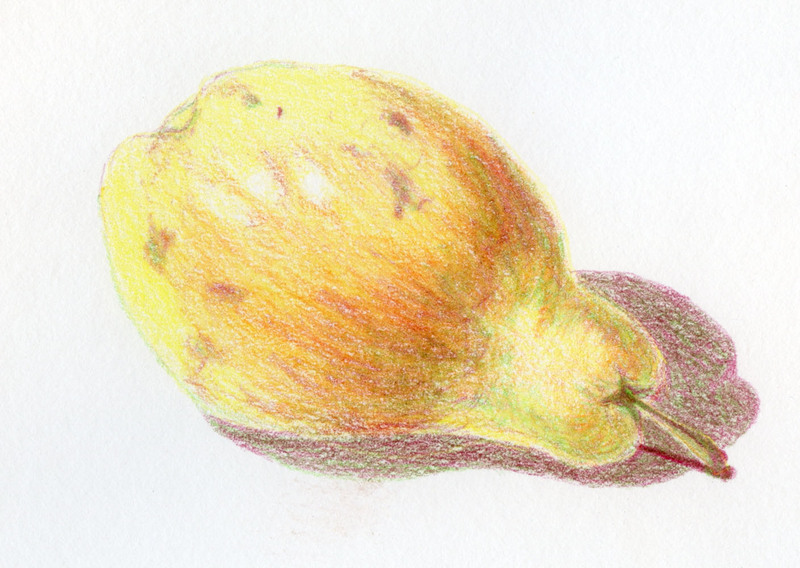 I usually spend an hour or so on a typical still life (a single fruit done with colored pencils), but the past couple of days I’ve given myself the challenge to make one in a half-hour or less and still feel like the sketch is finished. 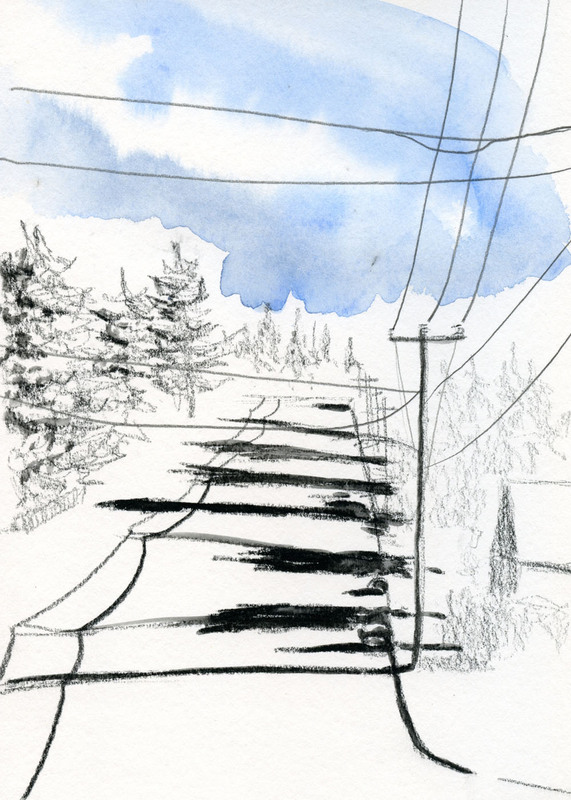 It’s not as satisfying to rush – I prefer the more meditative quality of taking my time – but on the other hand, it’s kind of exhilarating to move quickly the way it feels when sketching on location and the light is changing or the rain is about to start. 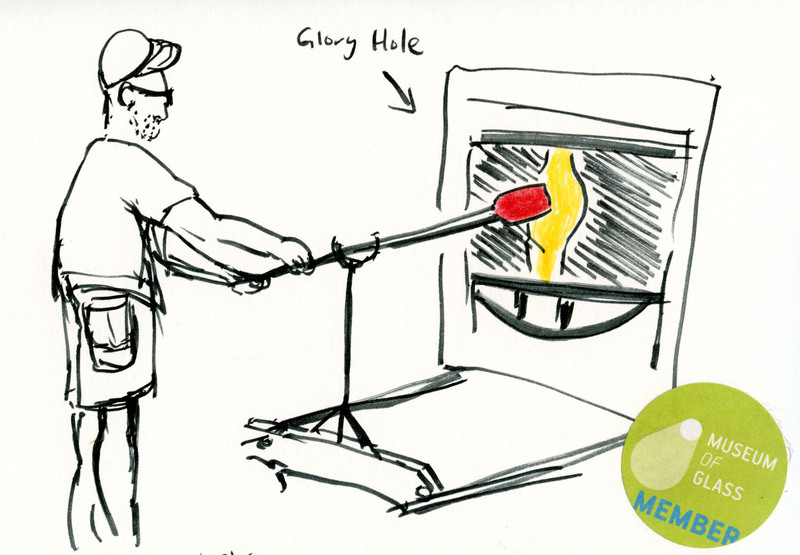 Tacoma’s Museum of Glass is a beautiful (and challenging) building to sketch from the outside. 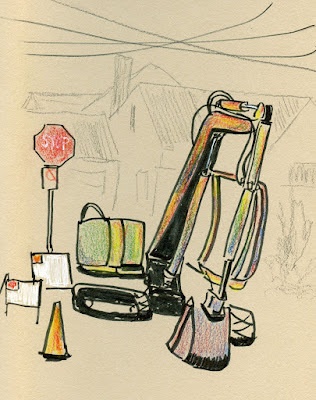 The last time I tackled its shining hot shop cone was a couple of years ago with USk Tacoma. 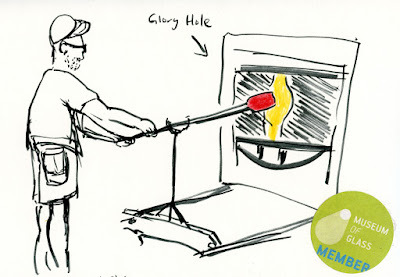 Yesterday was too cold and drizzly to sketch outdoors – a good day to stay inside the museum and the toasty hot shop. 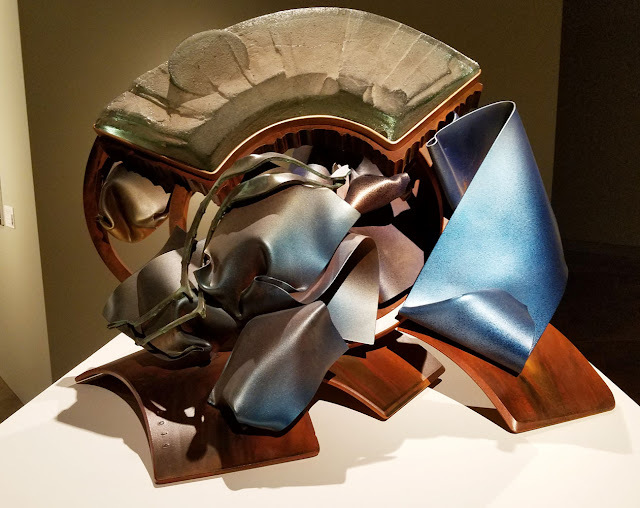 I made one sketch of an artist working hot glass at the glory hole, but our real purpose in being at the museum was to see Complementary Contrasts: The Glass and Steel Sculptures of Albert Paley. 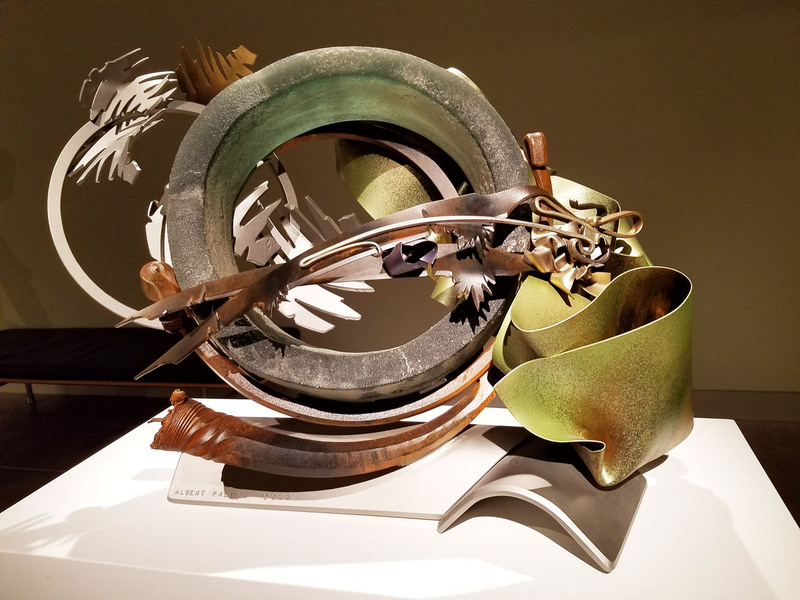 Several years ago we saw an exhibit of Paley’s stunning metal work, so I was already a fan. This show takes his abstract, sensuous, organic work to a new level, putting glass and steel together in surprising yet fully integrated ways. 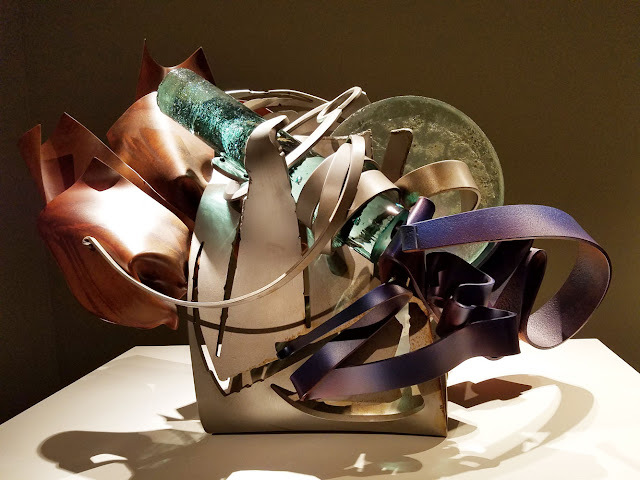 Despite the difficulty of resisting the temptation to touch, I was pleased that none of the sculptures were in cases – viewing art is so much better without a barrier. (By comparison, all of Michael Taylor’s work in the same museum was displayed behind glass, and it felt remote.) But I didn’t dare try to sketch these twisting, twining expressions of texture and form – they were better enjoyed and appreciated without attempting to capture them. 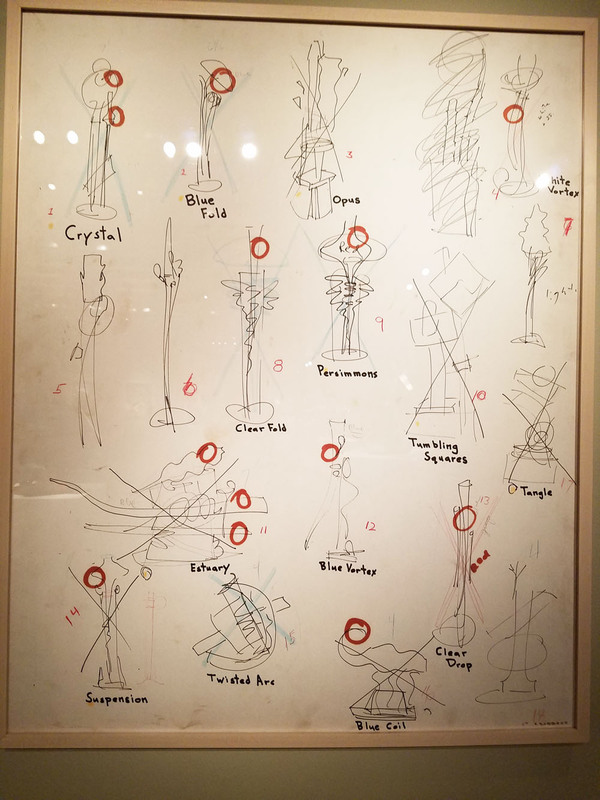 Another part of the exhibit that I appreciated was the inclusion of several proposal drawings and sketches Paley produced. 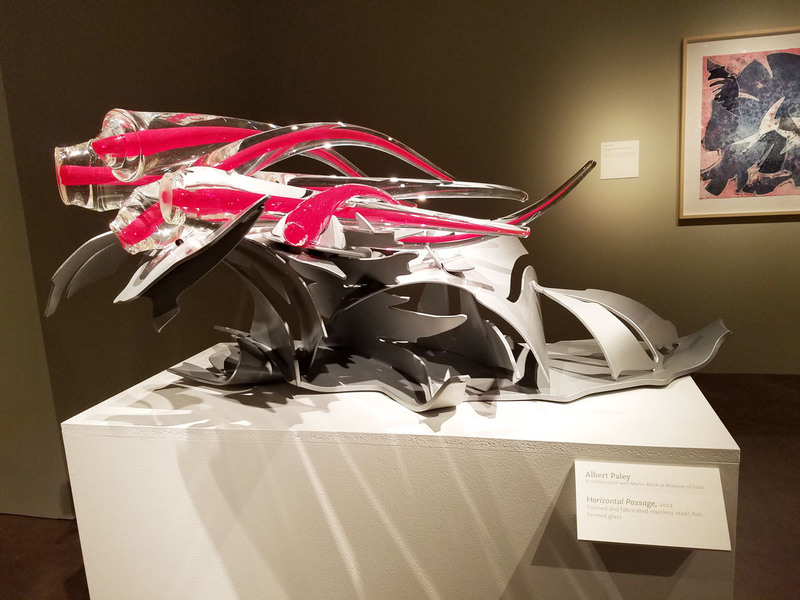 It’s fascinating to see his mind at work as he imagines a piece, transfers that vision to a 2-D image, and then transforms that into a 3-D form. 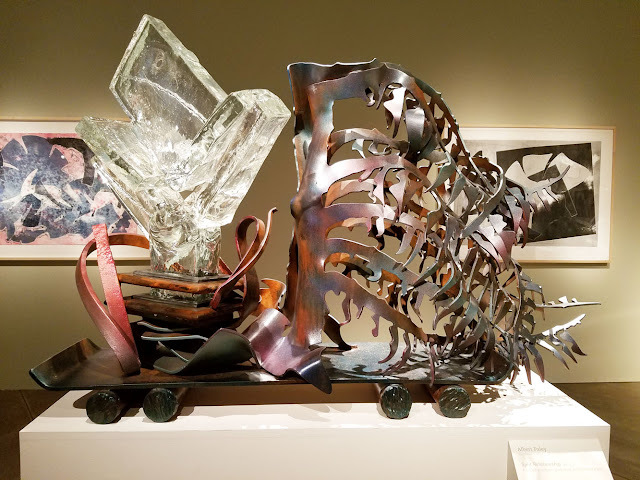 Below are some of my many favorite works in the exhibit. 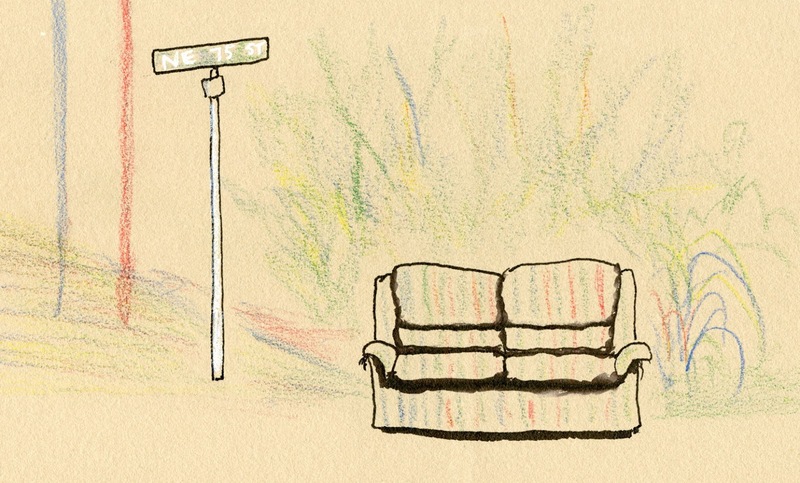 Although it’s not unheard of, urban couches usually hibernate in winter. 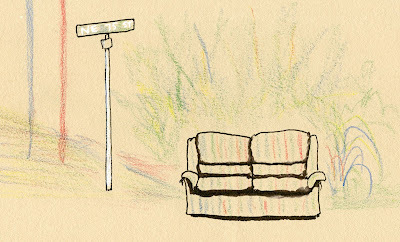 People move out of rentals at all times of the year, but “free” furniture doesn’t sell well when it’s all wet. Which explains why this striped one in the Wedgwood neighborhood has been in the same spot for at least three days – it’s getting soggier every minute. I’ve been wanting to sketch it since the first time I saw it, but to do so would require parking illegally across the street. Today I threw caution to the wind, parked dangerously close to a stop sign for a few minutes, and bagged another trophy. With plans to meet friends for lunch, I arrived at the Pike Place Market a little early so I could sketch. As it has been the past few days, the morning started out bright and sunny but cold. While the Market can be intolerably crowded on a warm summer day, it’s laid back and almost quiet in February. 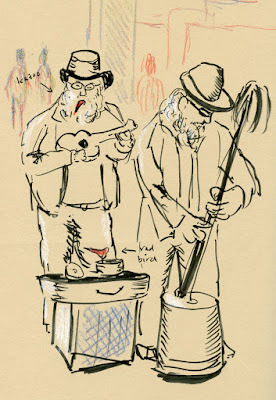 In one of the busiest spots, where the fishmongers entertain tourists by tossing salmon to each other, two white-bearded guys performed an eclectic mix of tunes from blues to the theme song to the Mary Tyler Moore Show. 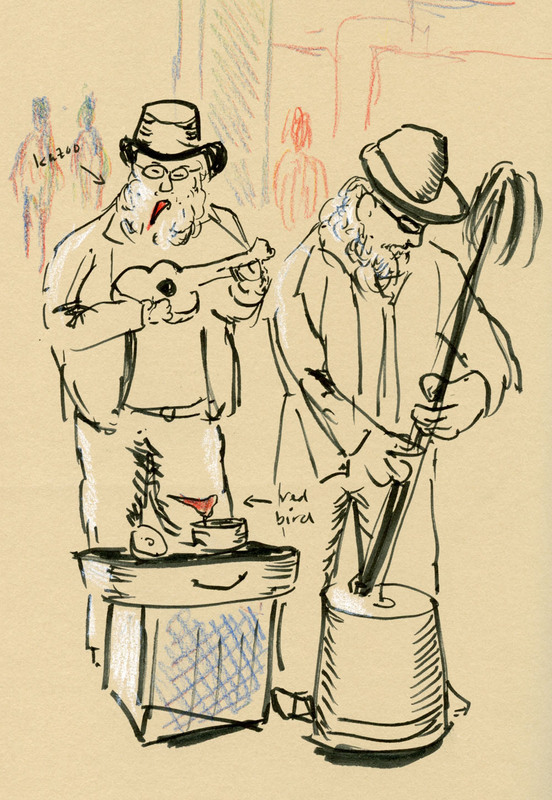 When a band’s instruments include ukulele, kazoo and washtub bass, you know the music is going to be interesting! The red bird attached to the can attracts viewers’ attention to their busking funds. It was getting close to the time I was meeting my friends, so I walked in the direction of The Pink Door. Nearby in Post Alley, a young man sang and played guitar to some tourists who dined outside a cafe, despite temperatures in the 30s. 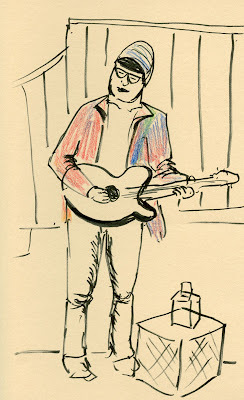 I sketched faster and faster before my fingers went numb while this musician shed his coat after a few songs. Some people are made of heartier material than I am, I guess. After two sketches, I was ready for the warm restaurant. Editorial comment: Readers of this blog know that one of my favorite sketch subjects is buskers. Wherever I travel and especially here at home in the summer, I seek out events where I’m likely to encounter musicians entertaining people on the street. To me, they add color, life and character to any urban space. Many people must agree with me, because they all snap photos of these buskers (stepping right in front of me to do so and blocking my view, I might add). And yet after they’ve taken a photo and enjoyed the music, most walk off and don’t contribute to the bucket. 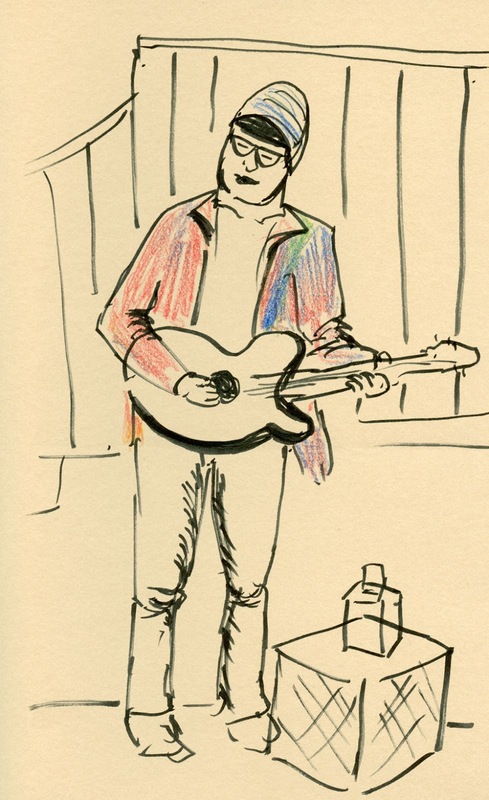 My personal policy is that if I sketch a busker, I always give them money afterwards. 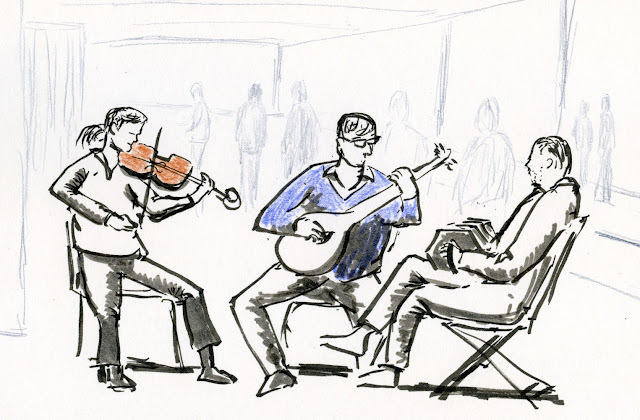 Even if I haven’t sketched them, if I’ve stopped to enjoy the music, I give them money. It’s a fair exchange either way. 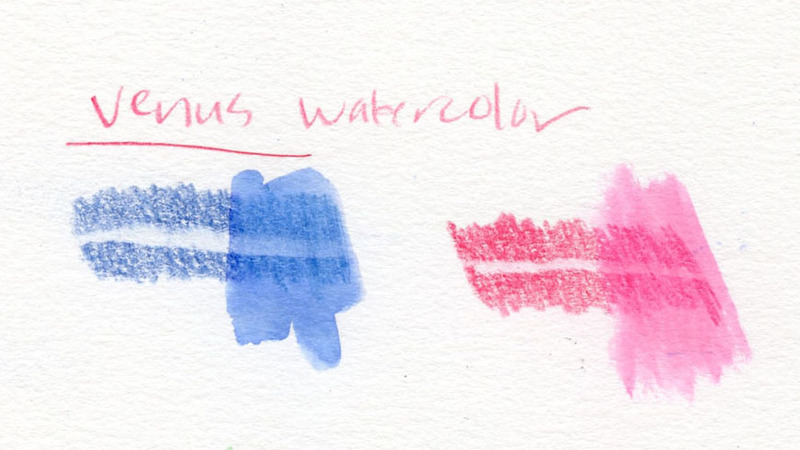 A short time later I was poking around eBay when I spotted an incomplete box of Venus watercolor pencils for a good price, and I was curious if they, too, would be as soft as the two Paradise versions I’d found. 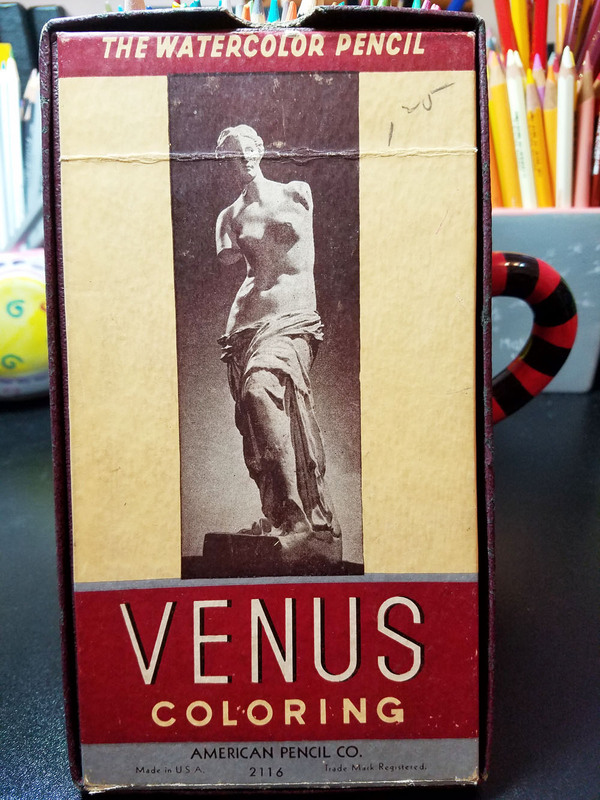 Made by the American Lead Pencil Co. of New York beginning in 1905, Venus pencils were apparently marketed to artists and architects (according to Wikipedia). 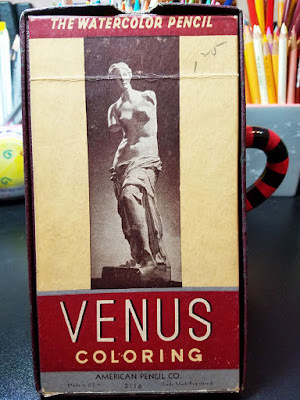 By 1956, the company had officially changed its name to the Venus Pen and Pencil Corp., which probably accounts for my two random ones having no other name on them. 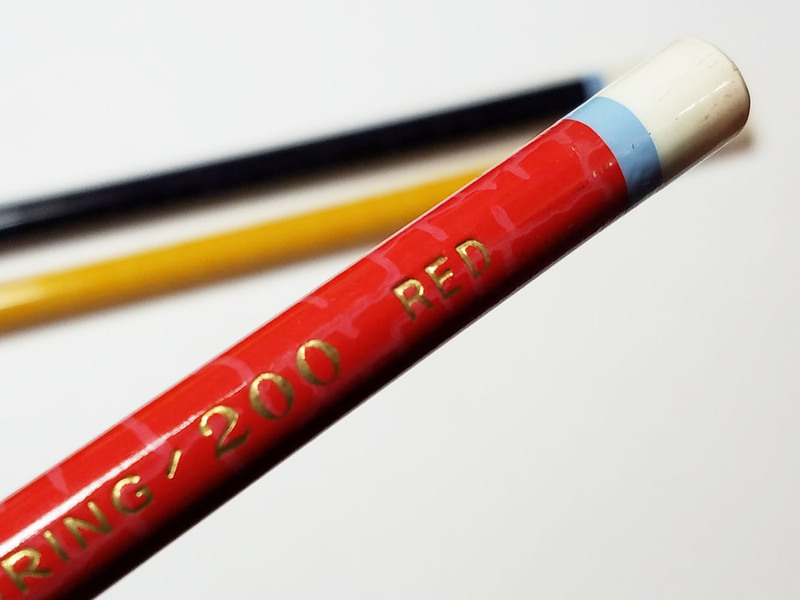 Eventually in 1973, the company was acquired by Faber-Castell. I couldn’t find much more historical information about Venus. That “crackeled coat” is a pattern painted onto the round barrel, not a true crackle, but still it’s a distinctive appearance I haven’t seen on any other pencil. The white cap and blue band are also nice touches. By contrast, the two Venus Paradise pencils have an unfinished end similar to Prismacolors. Modern-day watercolor pencils always sport a tiny paint brush icon next to the logo or color number so that they can be easily distinguished from traditional colored pencils. Interestingly, the Venus pencils lack such an icon. The Paradise pencils are obviously newer than the watercolor ones, since they no longer carry the American Lead Pencil name. Usually I go for older typefaces, but in this case, the Venus Paradise logo is quite wonderful. Logo on the Venus watercolor pencils reviewed here. The top two pencils are the newer Venus Paradise pencils with plain, unfinished ends. I love that Venus Paradise logo! 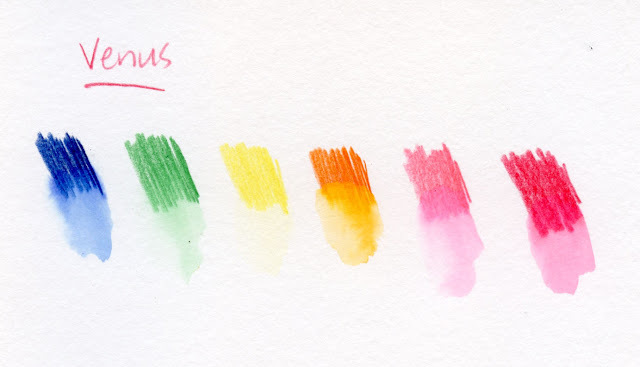 Unfortunately, the distinctive crackle coat and end cap are probably the best features of the Venus watercolor pencils, which are possibly the hardest colored pencils I have ever used – certainly the hardest water-soluble pencils. To get any pigment, I had to bear down so hard on them that I was afraid I was going to flatten the toothy surface of the Stillman & Birn Beta sketchbook page where I made test swatches. Applying water was just as disappointing – very wimpy washes. If they were being marketed to architects, though, I could see that their very firm cores might be useful. They would retain a point forever, and they could easily be used for color-coded writing. I didn’t bother making a sketch since I knew they would be frustrating to use. I was still curious, though, about the claim that they were indelible as well as water-soluble. That seemed contradictory: If a pencil washes with water, how can it be indelible? I recalled my recent education in the NoBlot ink pencil, which I also acquired at Seattle ReCreative without knowing what it was. Ana at the Well-Appointed Desk talked about the Sanford version of the NoBlot; mine is branded Eberhard Faber. In any case, the unusual “ink” cores in these old pencils really are indelible in that they can’t be erased. When the marks, which look like graphite, are washed with water, they turn bright blue, and once dry, that “ink” is also indelible. So, to my mind, the NoBlot is, indeed, both indelible and water-soluble. 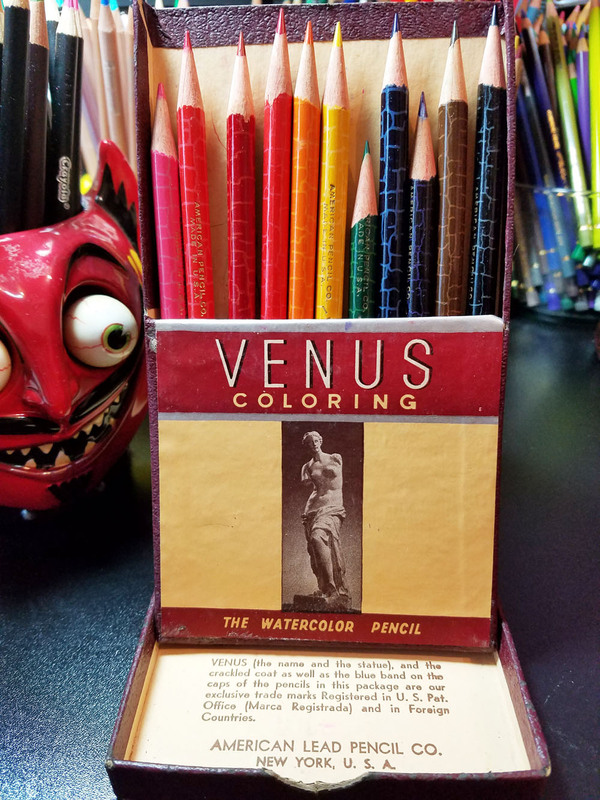 Could these Venus pencils have similar cores? I scribbled some test swatches on Canson mixed media paper and washed one side of the swatches with water. After the paper dried, I ran my electric Seed Sun Dolphin eraser over the marks. The dry part was erased about as well as any colored pencil, so it’s not exactly indelible. The washed part was slightly less erasable, but not what I would call permanent, by any means. Hmm. So much for indelible. 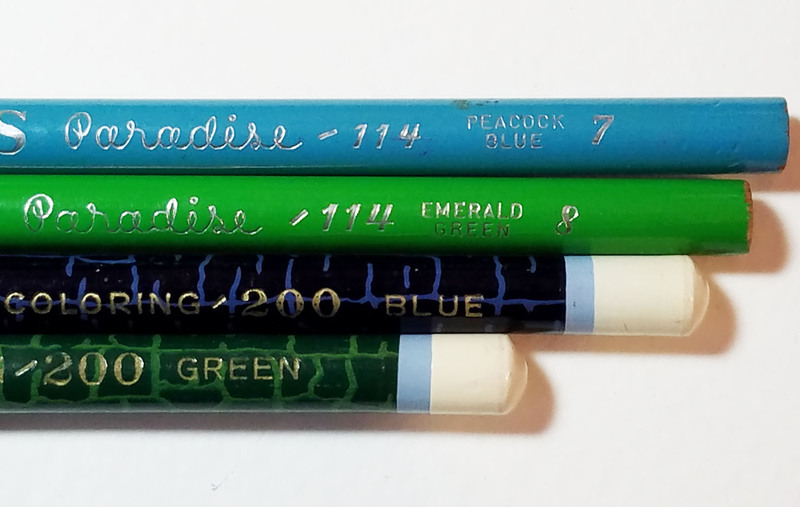 Although these Venus watercolor pencils turned out to be a disappointment functionally, I’m happy to have a few with the original American Lead Pencil Co. branding, fancy crackle and all. 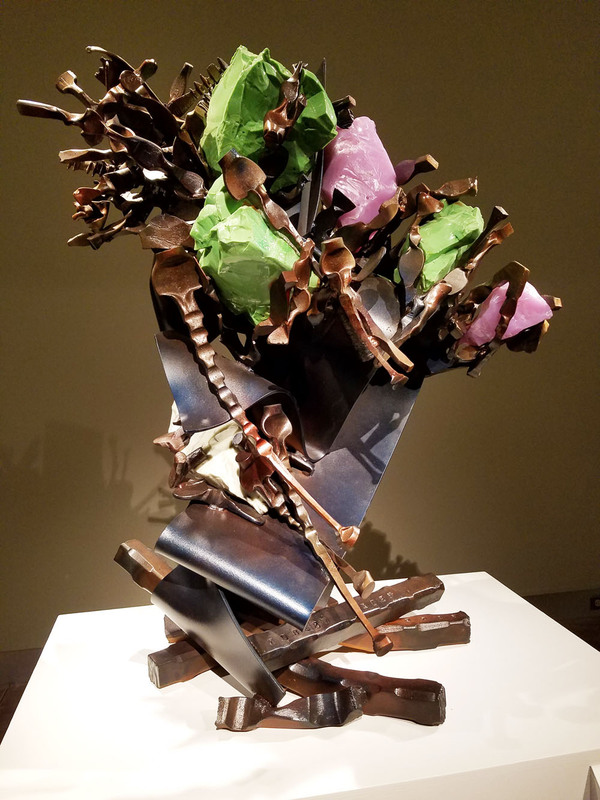 Only the green and purple colors seem to have been used much at all by their original owner. . . was that person frustrated by the core’s hardness and wimpy wash, too? 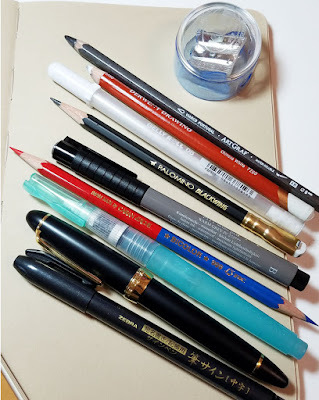 Back then, they probably didn’t have fabulous Caran d’Ache Museum or Faber-Castell Albrecht Durer watercolor pencils as an alternative as I do now. Learning about history often makes me grateful for what I have in modern times, and these crappy Venus pencils are one example. As for those two soft and creamy Venus Paradise pencils (which are not water-soluble at all) that I stumbled upon . . . now I’m on the hunt for more. Perhaps the Paradise line was developed to compete with Prismacolor at some point . . . ?